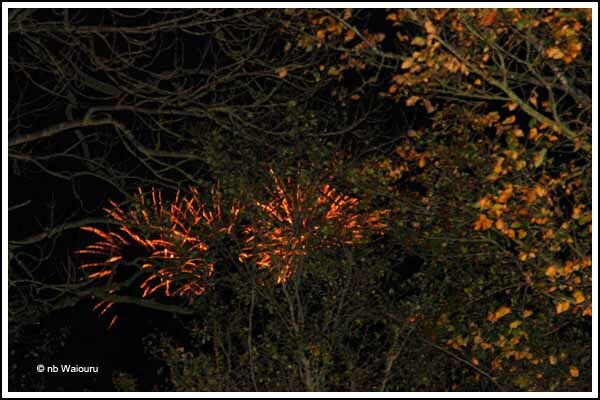 The fireworks display on Sunday night was held in the grounds of Dorfold Hall. 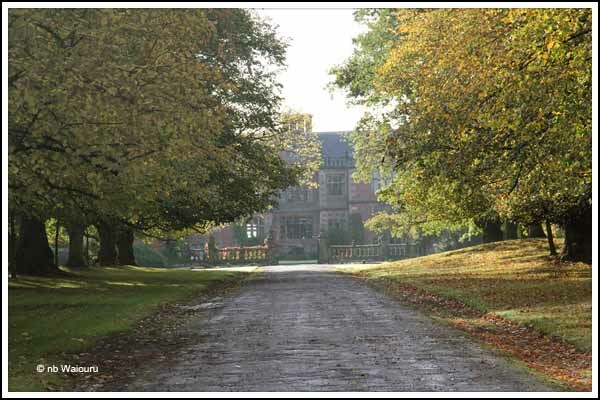 I’d previously walked past the estate so on the last occasion I took a few photo’s. 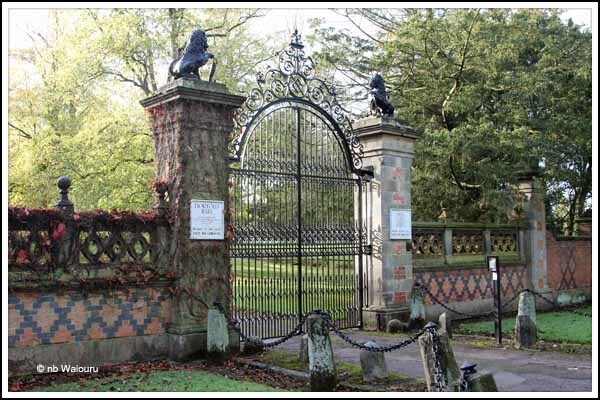 Nice set of gates. Now electrically operated by a keypad. 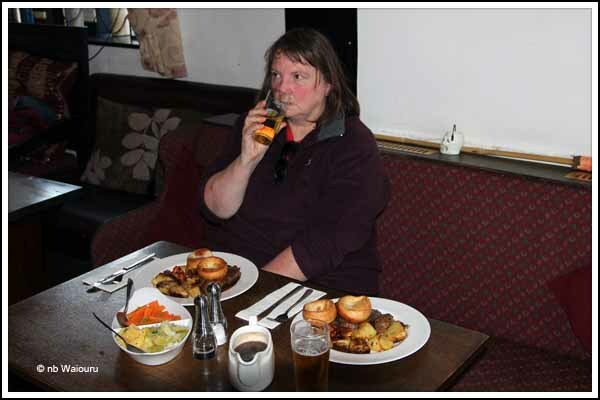 After having experienced a delicious roast beef lunch at the Star Inn, Acton on a previous occasion we decided to do it again today. 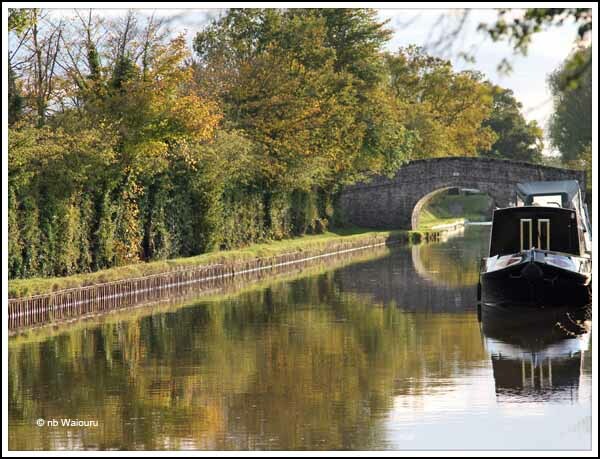 The distance to the Star Inn is shorter from Nantwich but as we’re moored on the Llangollen at Swanley there wasn’t much choice other than to walk the 1½ miles. However we knew the meal would be worth the exercise. We sat out in the beer garden soaking up the sun when I noticed the rear roof on the pub. 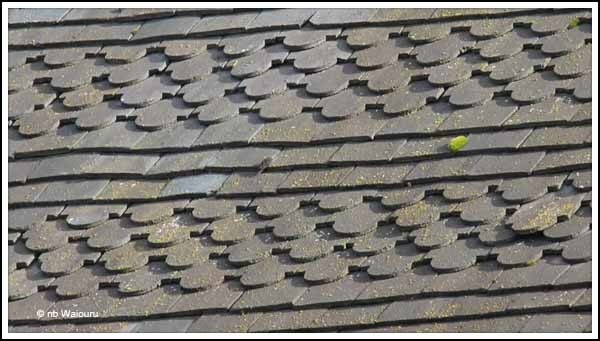 The slate tiles are a slightly different shape. You can see it more clearly in the next photo. There must have been an additional cost in having slates cut and the pattern laid. Meantime Jan was chatting with the friendly member of staff who informed her he was the chef and what a great couple the proprietors are. You could tell the Star is popular by the number of customers pouring through the door. Lunch was delicious. No room for dessert and a 1½ mile walk home to let it settle. Over the past few weeks the following signs have appeared all around the area. Two days ago I was walking past a meadow where I noticed a heavy vehicle delivering temporary load bearing plates and matting. I immediately thought it was being laid to allow heavy vehicles access to the meadow. The following day there was more activity. The venue is going to be a “sea of mud”! 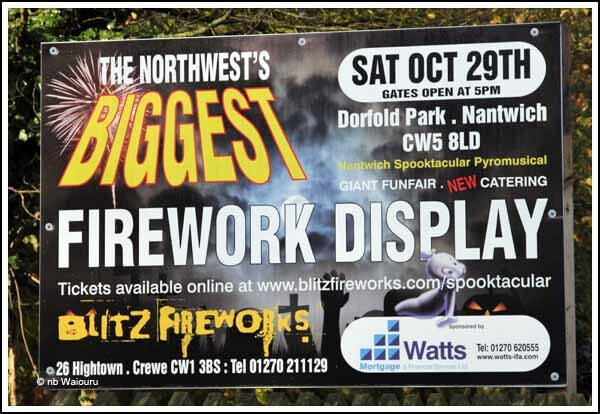 At 7:50pm last night Jan commented she thought the fireworks display might have been cancelled due to the bad weather. I suggested we wait until 8:00pm and that’s when we heard the first explosion. Earlier I had considered walking to a location where there were unobstructed views to the east. 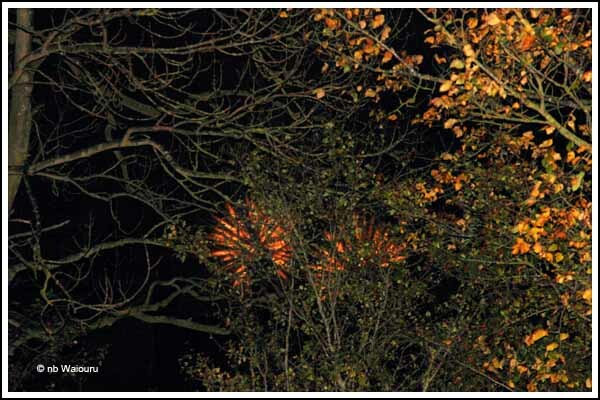 But then decided only a fool; or someone very dedicated; would go out in the cold and rain with an expensive camera to take photographs of fireworks. Instead, I stuck my head out the back hatch and took a couple of quick snaps. Actually the quality of the photo’s surprised me. 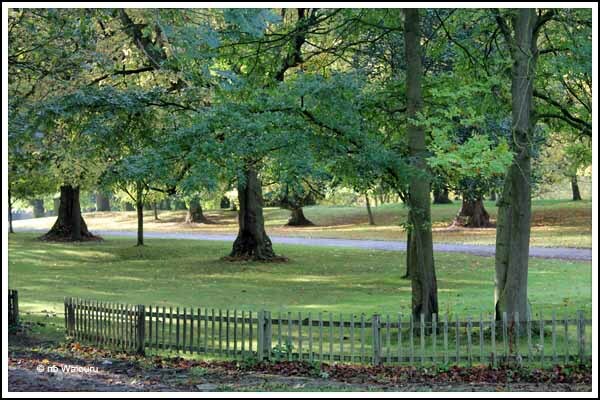 I couldn’t see the trees with my own eye and the camera collected far more detail. Actually it was 1½ miles to the fireworks display and the camera was still able to snap the aerial explosions. I quickly ducked back into the warmth of the boat and all I could think of were those poor parents holding onto their children in the cold, wet, darkness standing up to their ankles in mud. I’m so please those days are behind me! 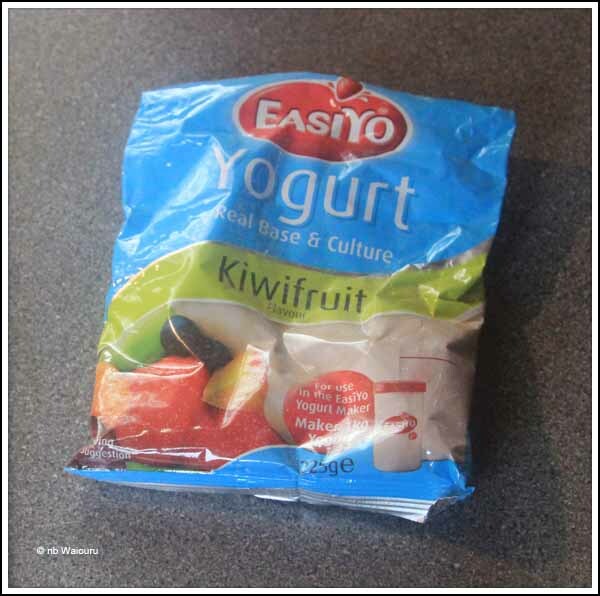 She has adopted an alternative method of extending the capacity of the standard EasiYo sachet by 400% (that is; you get four times as much yoghurt from the sachet). 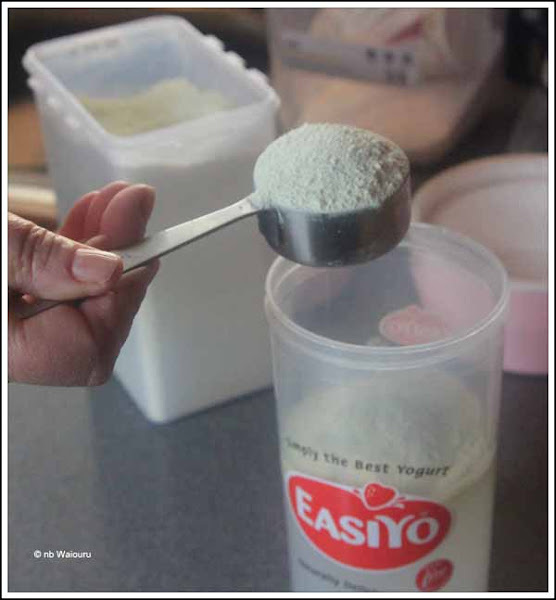 This alternative method is also simpler than her previous method as it doesn’t involve retaining any of the previously made batches of yoghurt. 1. 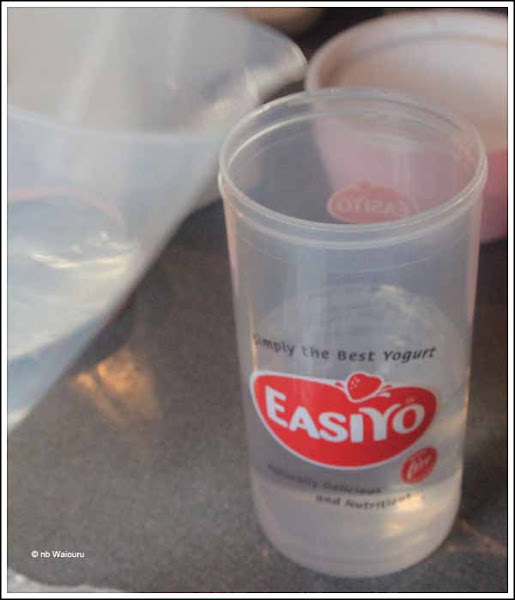 Start making the yoghurt the normal way by adding the water to the container. Now add one cup of milk powder. Jan uses skim milk powder. Mix together and top up with cold water. Put the lid on and shake it to mix the ingredients. Then continue the normal process. This method is considerably simpler than her earlier process. 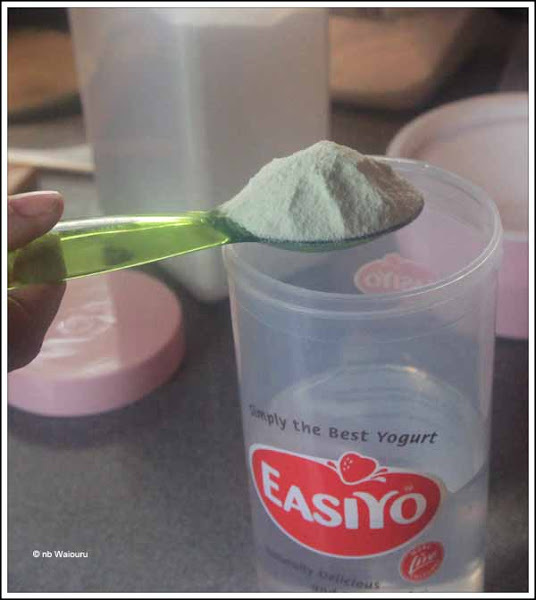 There is no significant reduction in flavour and it extends the sachet from one litre of yoghurt to three or four litres depending upon how much yoghurt powder you use. 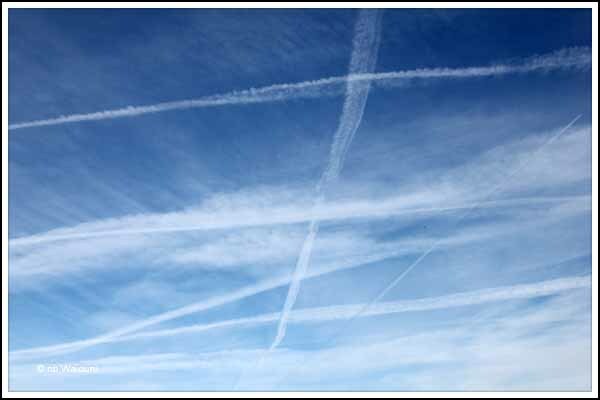 Most of the time we walk around looking in a vertical arc between the ground and twice our height. Today I made a particular effort to look higher and the results were quite interesting when it came to the buildings around Nantwich. 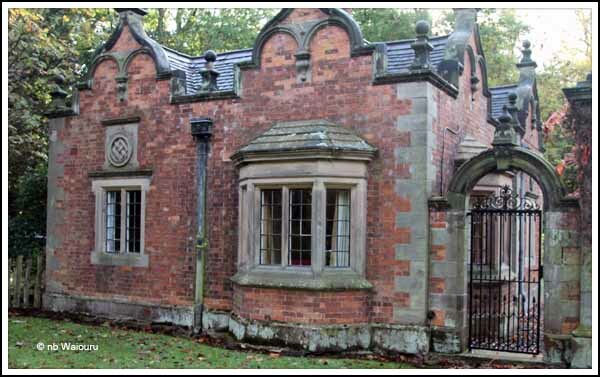 In the gable of one large brick Georgian style building which now appears to be comprised of flats were the words “Cheshire Constabulary”. It appeared to be a former police station and I assume was sold because the layout no longer suited a modern vehicle based police force. 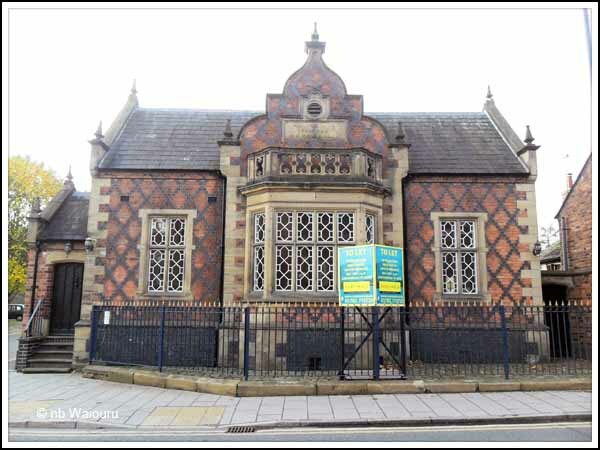 Opposite it was was another more attractive but vacant brick building. Nothing changes! Even back then the banks had all the money and attractive premises to operate from. There was one very plain and boarded up brick building. I thought it’s appearance was quite severe and then I saw the sign in the gable. Well I’d heard of Methodists….. 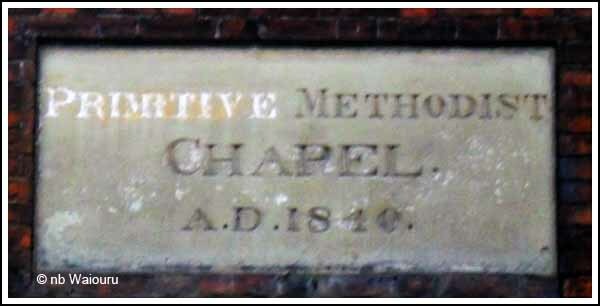 But Primitive Methodists was something new. I’m now enlightened having read Wikipedia <here>. A.D.1840 That’s around the time the English settlers were arriving in New Zealand. At 4:30pm I received a text message on my mobile phone from +447XXXXXXXXX. The message stated. As I haven’t had an accident, and therefore have no intention of claiming compensation, I can only assume this is a misdirected text message or a scam. Probably the latter. Unless more information is forthcoming I will simply ignore it! Don’t worry… you haven’t been overdoing the drinking. The photo is actually blurry! The road runs East-West and therefore points towards Wales. I assume this is the background to the name. 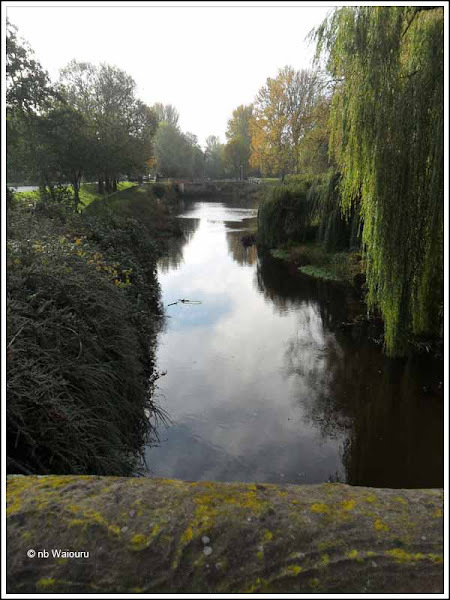 At the Nantwich end of Welsh Row is the River Weaver. It may not look much of an obstacle today, but until Edward I sorted out the dastardly Welsh around 1283 I can envisage a tide of them pouring out of Wales to do some looting and plundering. The river would have formed a natural obstacle channelling the horde towards the few bridges which would have been defended by the English. The river has obvious gotten narrower over the centuries because some distance back and parallel to the river, I found this street. Many of the older streets are named after their use. It logical to assume this is how streets originally obtained their names. 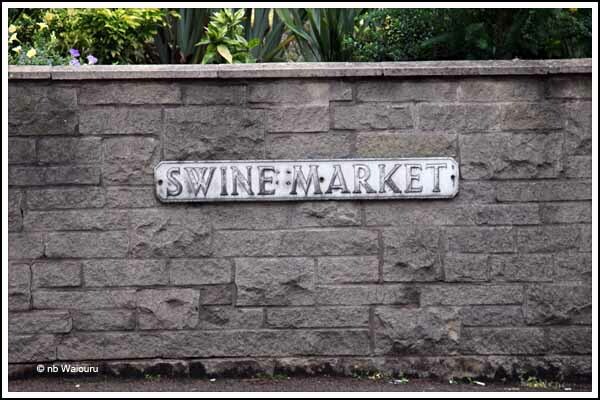 You went to Shoemaker Street to buy footwear or Sheep Lane to purchase your mutton. Oh Yes…… Bring them back please! I think this one was named after a boat builder I’ve met. But then I could be wrong! The dinner last night was a “Jan Special”. This woman can make a fantastic meal out of nothing. And as they say……. An army marches on its stomach! The root vegetables were like me…. old and wrinkly! Jan cut them into chunks and then placed them on a flat tray before sprinkling olive oil and lawn clippings rosemary on them. She then roasted them in the oven. Meanwhile the sausages baked in their own juice fat. Two tired oranges had their rind removed and the juice squeezed from them. From this Jan made a self saucing, upside down, orange pudding. It tasted fantastic. There was a small medium portion left over which she was going to throw out. However I somehow found the room to squeeze it in. Well I am going to walk another 5 miles tomorrow! Even local the heifers enjoyed part of the meal when Jan tossed all the peel into the paddock. I was then called to the back door to look at the view. Who can complain when you have a view like this! 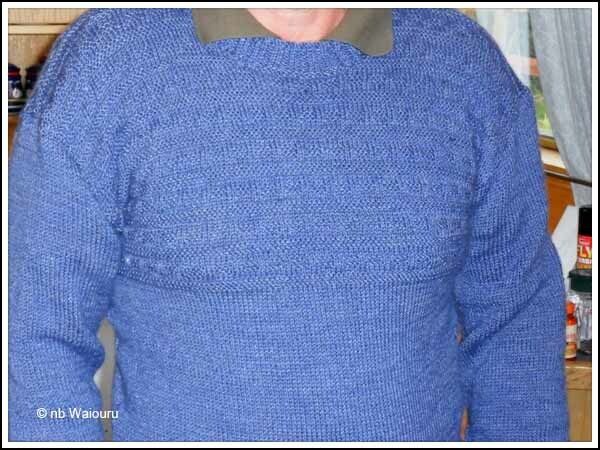 I’m now the proud owner of a guernsey style jumper (or gansey) which Jan has just finished knitting. She chose the colour as I have no colour sense (according to her). The original guernsey design came from the Channel Islands and was developed as a garment for fishermen who required a warm, hard wearing, yet comfortable item of clothing that would resist the sea spray. A hard twist is given to the tightly packed wool fibres in the spinning process and the tightly knitted stitches, produced a finish that would "turn water" and is capable of repelling rain and spray. My guernsey is made of softer wool and whilst it adheres to the original design it’s not tightly knitted and wouldn’t repel water. But it’s warm… and that’s the main thing! My girl has gone back to knitting knee blankets and I might just need one of those. Meanwhile it’s started to rain, which means boats are allowed to go faster when passing moored boats. I wonder how much we’ll get bashed around on the mooring if it starts to snow! 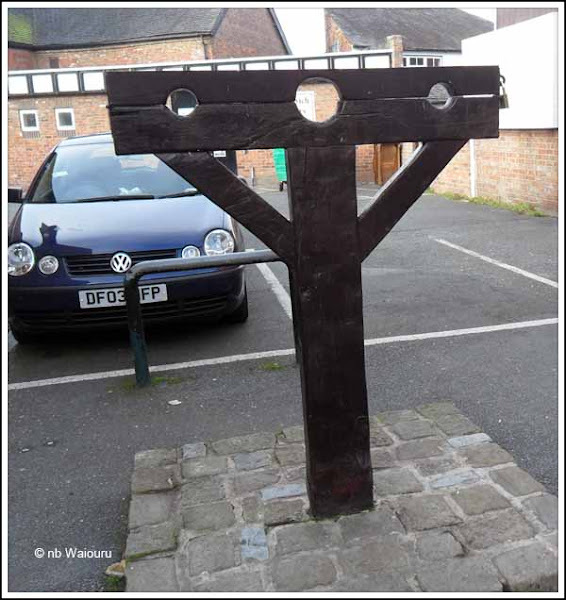 This morning I walked into Nantwich and reported to the police station. Spoke with my probation officer the lady on the reception desk and gave her the wallet Jan had found in the hedgerow beside the road. We assumed it had been stolen and then discarded as it was empty apart from a bus pass and a usb thumbstick. Hopefully the police will be able to find the owner from the details on the bus pass. I went on to purchase some urgently needed vegetables at Morrisons where I discovered they were running a week long promotion (chance to win £100 each day). Jan tells me I’m walking back to town tomorrow to purchase her magazines essential supplies. Well the final game of the Rugby World Cup had me on the edge of my seat. It was a damned close thing with only one point being the decider. The French played very well and the Kiwi’s were……. OK. Whilst it was a nail-biting finish the game wasn’t all that interesting. 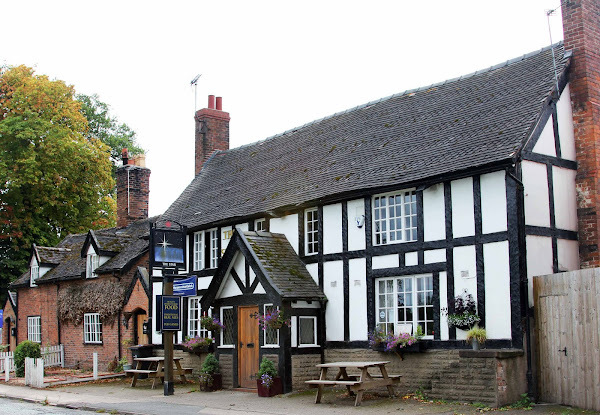 Jan and I walked the 1½ miles to the Star Inn for a delicious roast beef lunch. The vegetables were well presented, although we both avoided the brussel sprouts. Interesting how you can dislike something after being forced to eat it during your childhood. We both feel the same way about broad beans. At least our children have something to thank us for! I phoned the marine insurance company today and renewed our cover for Waiouru. It’s difficult to believe a year has passed since the construction of Waiouru commenced. I scratched my head wondering why the premium had reduced and legal expenses coverage is now included at no extra cost. One can only wish it had been included this time last year. Meantime we have received in the mail a hard copy of the marine surveyors report. 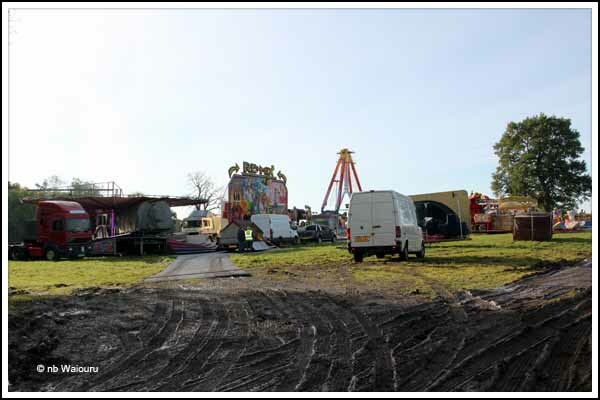 It confirms our earlier advice that in her current condition Waiouru now has a value of £12-14,000. Based on the photographic evidence Waiouru’s value was approximately £50,000 when we first saw her on arrival in the UK back in late May. So much for Ben & Kelly Harp claiming they had spent £91,000 on her. No good crying over spilt milk…….. We must remain focussed on ensuring the dream happens! I’m starting to get more than slightly annoyed with the language of the TV news reporters and politicians. It grates on me when I hear “truly awful” or”truly outrageous”. It implies some situations are “falsely awful” or “falsely outrageous”. The fact is it’s either awful or it isn’t! The “truly” bit is meaningless drivel. Another thing that irritates me is when I hear or read about our “sporting heroes”. Heroes are people who have performed a very courageous act and in doing so place their own safety a risk. Outstanding sports men and women are “champions”; NOT heroes! And whilst I’m having a rant. I do hope the British TV reporters don’t start the same nonsense as many of their Australian counterparts and begin every sentence with the word “Now”. The word isn’t needed to make sense of what’s being said. It sounds like a technique they have been taught to act as a “gap filler” so they can get their delayed action brains in sync with their lips. I just about climbed up the wall when one evening an Australian reporter used the word 13 times in her one brief appearance. Now, I’d better stop ranting otherwise I’ll miss the beginning of the truly interesting rugby. Jan has been surfing for some time looking some warm footwear for use inside the boat. Last time we rented a car to visit Waiouru we also used it to do some food shopping at the big Sainsburys on the far side of Nantwich. 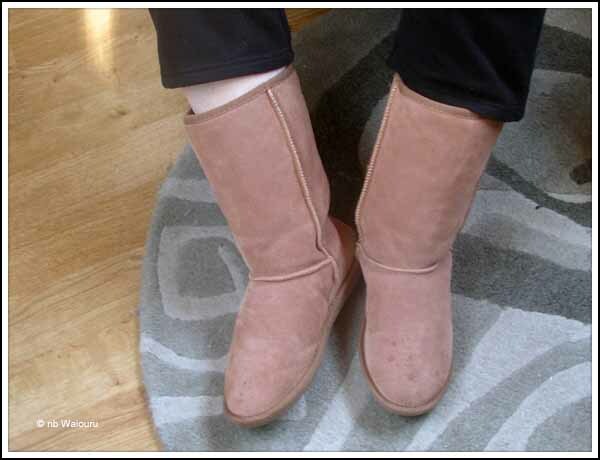 Whilst browsing Jan noticed Sainsbury’s had sheepskin lined boots she thought might be ideal as slippers. Unfortunately they didn’t have a pair in her size. Two days later I decided to walk from Kelly-Louise back to Sainsburys and see if they had now had a pair in Jan’s size. Sainsburys had restocked and she was in luck with a pair in her size now available. Moreover they were on special (20% discount) costing me £20. As a result she now has warm feet. The other footwear we have been considering purchasing is “gum boots”. Fellow kiwis and aussies will immediately know what I mean. English readers will know them as “Wellingtons”. Why the difference in names? 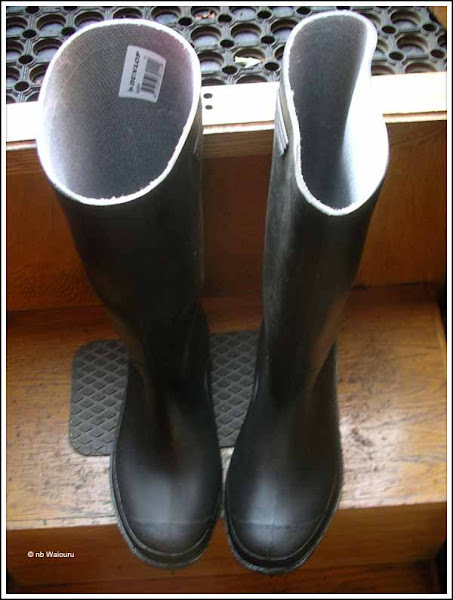 Kiwi’s call them gumboots because back in the 19th century they were worn by gum diggers. Today no self respecting kiwi farmer would be found without a pair. My assumption is the term originated with the Duke of Wellington. No matter what they are called we think we should have a pair each to use on Waiouru. Actually we probably need them right now as the grass is getting longer and wet, plus the ground is getting more churned up by the cattle in the field beside the mooring. So yesterday I splashed out and purchased a pair in the war surplus store at the Nantwich for £10.99. They are made of PVC. The genuine rubber version in the store cost £24.99! I usually take an 8½ shoe so I asked to try a size 8 and 9. To my surprise the 8 was too big and I eventually purchased a size 7. They are quite tight around the calf. However I’m going to leave them tight and see if it prevents my socks from working down into the toe of the boot. Otherwise I’ll probably cut 4-5 inches off the top. Both Pip (nb Windsong) and Carol (nb Rock’n’Roll) left valid comments on my last post regarding the freezer. I’d completely overlooked the length of the Engel assuming it was 2ft and would fit under the bed. I found the tape measure this morning and measured it. It’s 25½ inches long. There then needs to be some clearance at the rear for ventilation. I’m thinking holes should be drilled in the floor to allow cool air from the bilge to pass up through the motor and electrics. However it’s too long to fit under the planned 2ft wide bed. Either I make the bed wider and reduce the width of the corridor and rear steps by a couple of inches or perhaps I can removed the ply wall lining and grab some of the space in the wall cavity. Another discussion with Andy! Carol also asked where I planned to put the second half of the mattress. I think it will have to go on top of the first half. If anyone wants to sit on the bed when it’s not extended then we will have to move the extension to another temporary location inside Waiouru. Meantime, I noticed in Paul’s latest post on The Manly Ferry he’s ditched the Wallabies and now supports the All Blacks. He might have his team selection right, but his geography is somewhat confused. 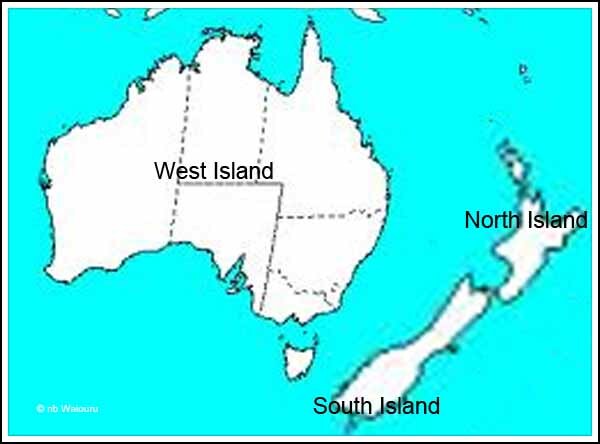 The following map clearly explains the geography of NZ. We wilted yesterday and started the Webasto. Only for two hours in the afternoon and a further hour in the evening. Our excuse is; our winter clothing is still packed and in storage. This morning I woke with only my nose protruding from under the duvet. I think I woke because the cold had constricted my nostrils. The control for the Webasto is at the end of the bed and I unsuccessfully tried poking the ON button with my big toe. However one of the advantages of Jan sleeping on the corridor side of the bed is she get the opportunity to get out of bed first and start everything. I stayed in bed with my hot water bottle (bladder) until it forced me out of bed! 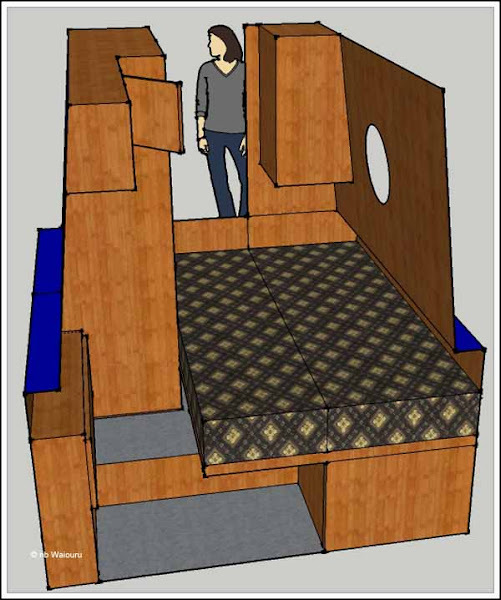 I’ve also been giving more thought to the layout of the back cabin and have revisited my Google SketchUp drawings. 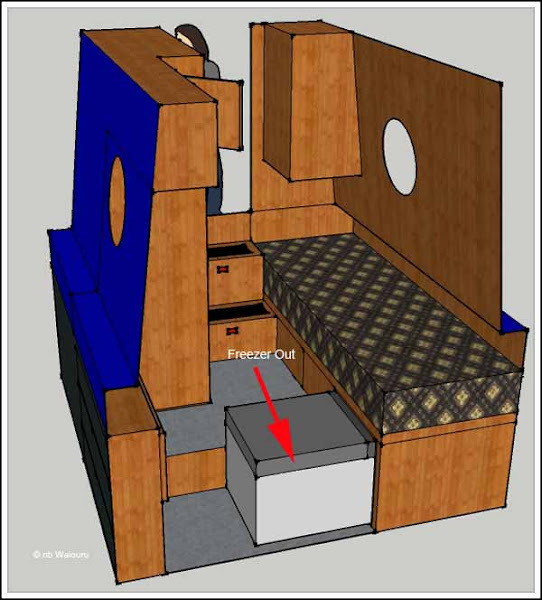 I think it might be possible to fit the small freezer under the bed if the step is moved from the galley partition to the end of the blackwater tank as shown in the following drawing. 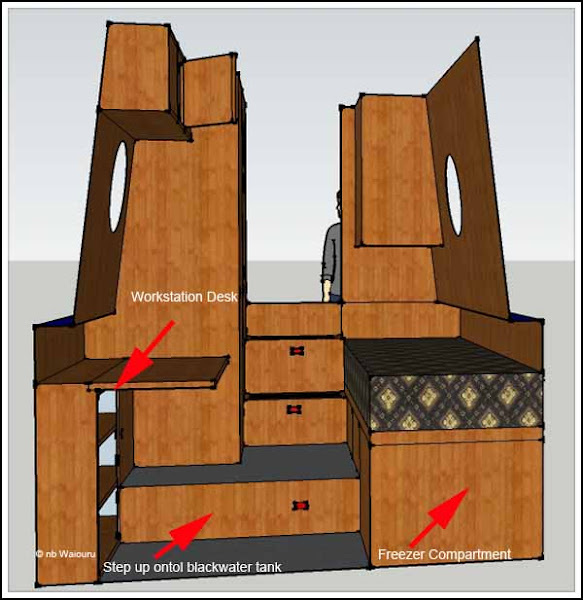 The cabin is 6’3” in length but because there is a structural cross beam, the blackwater tank is only 4’6”. This means there is 21” of floor in the back cabin at the same level as the rest of the boat. The Freezer is only 17” wide and I think a chair will fit into the floor space opposite the freezer. This is my impression of what it will look like when the freezer is pulled out from under the bed space. The bed will not extend out to 4ft whilst the top step from the boat is in place. My initial thought was the step should be collapsible; but I now think a better solution is to make it a removable box. It can then be used as a step into the Galley when the bed is extended. This next drawing shows the bed extended to 4ft wide. Things are starting to get rather tight for space. The workstation desktop folds down providing standing room when extending and making the bed. My concern other concern is emergency egress. It will be possible for the occupants to exit via the rear boat doors. 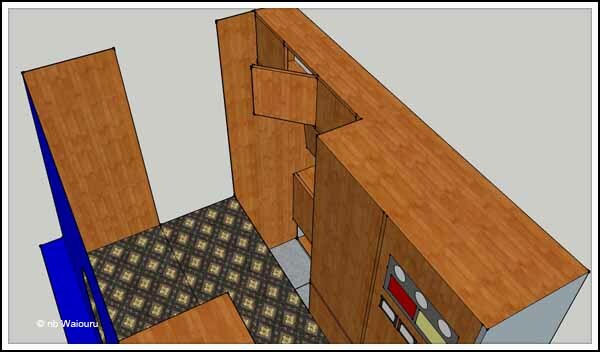 I also think the partition door between the rear cabin and the galley should be a ‘stable’ type. The top step from the back cabin can then go inside the galley allowing the occupants to climb in and out of the bed via the galley. This drawing provides a view from the opposite perspective. Making up the bed will be more complicated than our own cross-over bed. But then this bed will be used for visitors and we don’t anticipate having any “permanent” visitors. Everything in narrowboat design appears to be a compromise! We have been watching the boats cruise past with smoke rising from their solid fuel stoves. However we haven’t lit the solid fuel stove on Kelly-Louise and probably won’t. However it has reminded us that the temperature is falling. Jan has been feeling to cold and has taken to wearing two pairs of socks. Both of us have noticed the cool breeze entering the vents in the front and rear doors. I’ve probably noticed it more than Jan as I’m the one closest to the bow doors. Jan made two observations regarding the vents. The first was our bedroom is in the front of Waiouru so if we have the vents in the doors then we will feel the cold breeze in the bedroom. Her second observation was how pleased she now felt about our decision to have the saloon in the middle of Waiouru thus avoiding the direct breeze from the front and rear vents. When we woke this morning I would have been tempted to light the stove. It was overcast and there was a strong breeze. The wind chill factor was high (for us!). But by midday the sun was out and the temperature was rising. If I had lit the stove we would be wasting fuel. 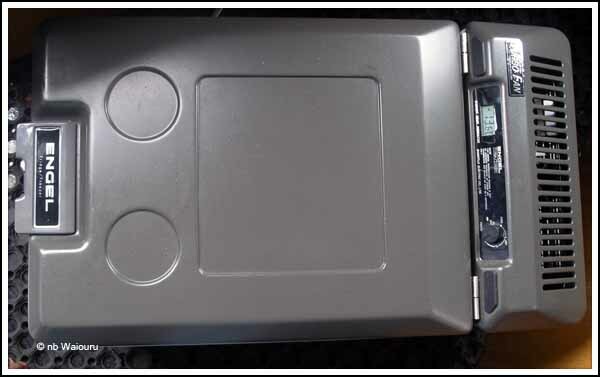 In a recent post Bruce on nb Sanity Again commented here on his difficulty in checking their lead acid batteries. This is something that has been concerning me ever since I first purchased the large Rolls batteries for Waiouru’s domestic battery bank. At the time I took a gamble there would be sufficient height in the engine compartment for them to fit. I’ve now been able to measure the height if the area on Waiouru and they will fit. However the clearance is so tight the Mk5 eyeball isn’t going to be able to peer down to check the level of the electrolyte. Nor will I be able to fit a hydrometer into the cell. Then I had an idea. If I created a removable base to the locker above I’d be able to access the top of the batteries through the locker. But then I remembered the locker above is actually the gas locker and it will have to be sealed. I could relocate the batteries to the opposite side of the engine compartment. Perhaps swap the proposed locations of the batteries and Hurricane heater. But then I’d have a very heavy battery bank on the same side of the boat as the shower, toilet, etc. It might affect the trim? Another solution is to fit an automatic top-up system such as the one <here>. However it’s not a cheap option. I think a discussion with Andy regarding the feasibility of option 2 is warranted. 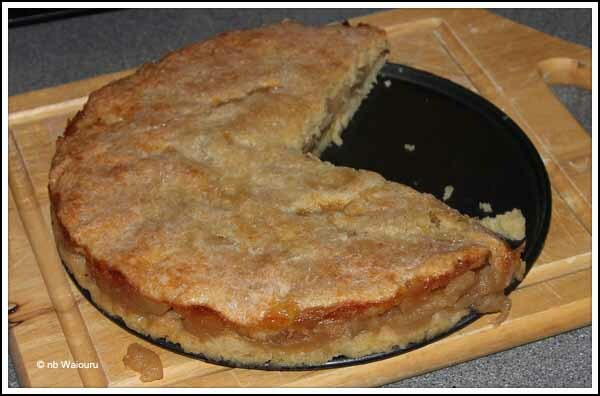 Meanwhile Jan has been working on her own solution to the problem of what to do with the last of the free apples. As you can see I’ve completed some testing. She usually adds cloves to the apple but this time it has cinnamon. Went down well with the Cornish ice cream! I could have done with my brother-in-law or nephew as the Tecma decided to go on strike. Of course the industrial inaction occurred a a critical moment when action was urgently required. After two attempted flushes and a rising water level I decided to take stock of the situation. I either had to prevent more water entering the system or connect a temporary bilge pump to the bowl. The obvious solution was to disconnect the main water by switching off the electrical supply to the water pump. Whilst this prevented more water entering the bowl Tecma still stubbornly refused to work. All noise and no action! So whilst I had solved the potential overflow I hadn’t fixed the underlying problem. My next thought was dry paper had jammed the impeller. I was unlikely as we have been very careful to ensure dry paper doesn’t enter the system. However it was a possibility, so I decided to let Tecma have a 30 minute rest. Thirty minutes later and the problem still existed. I considered bailing…. But then rejected this as the “action of last resort”. After scrounging around in the hedgerow I found a twig about half the diameter of my little finger and 40cm long. I used this to give a brief twirl in Tecma’s mouth and this resulted in an immediate large and smelly “belch”! Tecma wasn’t on strike…….. He had wind! After I’d “burped” him he happily went back to work. Another lesson learned. In the morning I watched the quarter final game between Australia and NZ. The Wallabies didn’t really seem to be in the game with the All Blacks dominating everywhere. Robbie Deans won’t be happy. I looked at my Australian passport and carefully placed it in the bottom drawer. Pulled out my NZ passport and gave it a wee kiss. WE WON… WE WON! Well I was never going to lose. Now where did I put my French passport? . Nah…….. I’m not going to need it! We woke this morning feeling rather cold. My thought was; it looks like the 3.5 Tog (a measure of thickness) duvet will shortly be packed away and replaced with our winter 13 Tog. However Jan subsequently told me we had slept with the window open! At my request, he agreed to take KL up through the lock and wind her so I can repair the blacking on the port side. 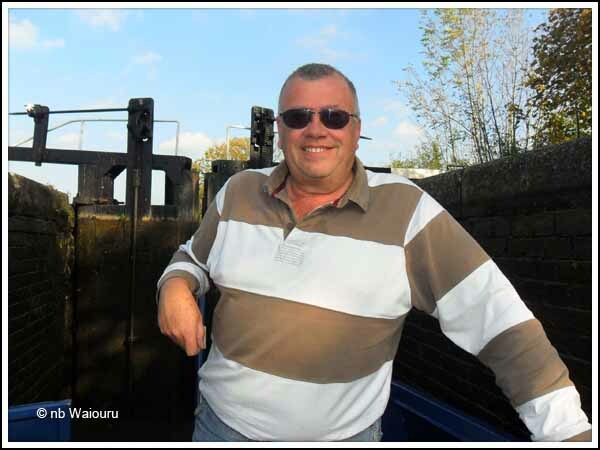 Having Peter at the helm gave me the opportunity to work the locks whilst Jan could play photographer. It wasn’t hard to see Peter was enjoying himself. When he wasn’t quietly singing, there was a big smile on his face. 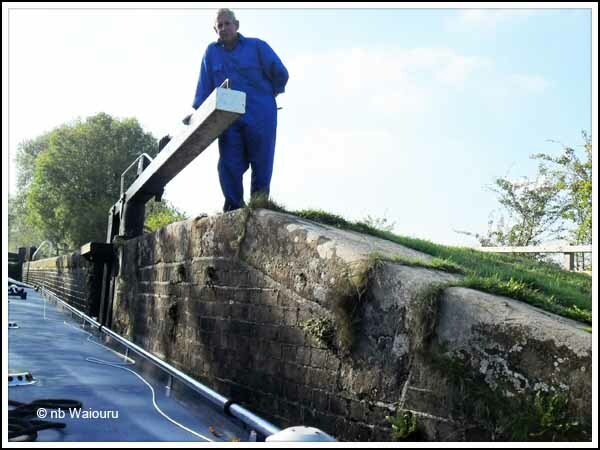 We arrived at the lock just as another boat was exiting, which reduced the workload. I was wearing my one-piece “Churchill” ensemble. It was quite appropriate for the tasks around the boat, however I discovered probably not the best for working locks. Once Peter had KL in the lock and I’d shut the gates I attempted to raise the upper paddle with the windlass. After fitting the windlass to the mechanism I gave it a powerful swing. The handle caught in the open neck of my overalls and then proceed to pop open all the press studs from my neck to the groin. Only some frantic finger-work on my behalf prevented my modestly from be outraged. [Note to myself]. The next pair of overalls must have a zip fastener instead of press studs! We spent the remainder of the afternoon solving the world’s problems; including the current GFC! But somehow I don’t think anyone in a position of responsibility will act upon our logical conclusions.